Following up to the news which broke yesterday, Latino Review Media is listing the full voice cast of Machinima’s Transformers: Power Of The Prime animated webseries. The list now includes the characters voiced by the artists. You can check out the full list, after the jump. Ron Perlman (OPTIMUS PRIMAL) – Star of the original Hellboy franchise, Sons of Anarchy, Hand of God, and Adventure Time. Jaime King (SOLUS PRIME) – Star of Hart of Dixie and Star Wars: The Clone Wars. Gregg Berger (GRIMLOCK/VOLCANICUS) – The original voice of Grimlock from the 1986 film The Transformers: The Movie. Nuufolau Joel Seanoa (Samoa Joe) (PREDAKING) – Professional wrestler currently signed to WWE. Mikey Way (SNARL) – Musician best known as the bassist from the rock band My Chemical Romance. Mark Hamill (MEGATRONUS) – Star of the Star Wars franchise. Also known for his work as the The Joker in various animated Batman projects. Wil Wheaton (PERCEPTOR) – Star of The Big Bang Theory and Star Trek: The Next Generation. Rod/Rodimus Prime from the 1986 animated film The Transformers: The Movie. Kari Wahlgren (VICTORION) – Well known voice over actress with credits including Rick and Morty, The Fairly Odd Parents, and Phineas and Ferb. Jason Marnocha (MEGATRON) – Actor from Bat In the Sun’s popular YouTube series Super Power Beat Down. Previously voiced the character of Megatron in COMBINER WARS and TITANS RETURN. Abby Trott (WINDBLADE) – Voice over actress with credits including video games Halo Wars 2 and Killer Instinct. Previously voiced the character of Windblade in COMBINER WARS and TITANS RETURN. Patrick Seitz (OVERLORD) – Voice over actor with credits including Call of Duty: WWII and World of Warcraft: Legion. Previously voiced the character of Devastator in COMBINER WARS and Overlord in TITANS RETURN. Rob Dyke (DEVASTATOR) – YouTube creator best known for his Seriously Strange series. Previously voiced the character of Devastator in TITANS RETURN. DashieGames (MENASOR) – Popular YouTube gamer with more than 6 million subscribers. Previously voiced the character of Menasor in COMBINER WARS and TITANS RETURN. MatPat (SWOOP) – YouTube influencer and creator of the web series Game Theorist, Film Theorist, GT Live and MatPat’s Game Lab. Previously voiced the character of Computron in TITANS RETURN. Frank Todaro (SLUDGE) – Voice over actor who previously voiced Starscream and Trypticon in COMBINER WARS and TITANS RETURN. Other credits include the video game franchise LittleBigPlanet. Poeple keep saying that Ron Perlman won’t make a good Primal, but he and Gary Chalk sound a lot alike. If you have to get someone big from Hollywood to vouce him, Perlman is honestly the best choice. Optimus Primal isn\'t voiced by Garry Chalk. Ron Perlman is Good, Who is the best know Hannibal Chau. I just hope Optimus Primal will be voiced by Takehito Koyasu in JP Dub. Did anyone else find Cybertron to feel very under populated? It didn't even feel like Cybertron. More like a small Transformers base on a moon or something. I guess it's budgetary. Too expensive to animate random Transformers in the streets or a larger city. Good voice acting alone, a good series does not make, according to master Yoda. I grow tired of watching Starscreams ghost episode 3423525, HotRod not wanting to be Rodimus and Optimus Prime dying and been brought back. At least the guy that did the first parody would create something epic out of this. Two of my major gripes with this franchise. Make this about an entire civilization again and not about a handfull of characters! Stop with the #@+*4# homages!!! Do something new with this franchise! I have nothing against Ron Pearlman, I like him. But Optimus Primal will sound like Ron Pearlman and not like Optimus Primal, and I'm just not ok with that. Megatron was the best part to me. He was a saving grace in CW, but now they are just overusing a rather tired trope. If this series needs anything it's not famous voice actors but better writing. Yeah, OP will be back too soon enough. I doubt it will take three episodes for him to become Orion Pax. The only good thing about TR were Fort Max, Hot Rod, Perceptor, Overlord, Computron, Devy and Menasor really. I hope we'll see more of them. I don't even know how they came up with the lines for the others. And Megatron's "I'm a cool moody anti-hero act is becoming very very old. I'm sure this was addressed long ago, but why is Frank Welker not a part of any of this? Frank Welker is a Busy guy. Well, I’ve got some bad news. I just spoke with Garry Chalk and he was not approached for the role. He did say that it being recorded in America is probably made it cost prohibitive due to extra travel expenses. Garry deserves his due soon. Hell all of the Vancouver VA's need to do a new Transformers project. I was referring to them bringing him back for Titans Return, but he could come back for PotP. He has a toy in the line. Hasbro wants to sell toys. 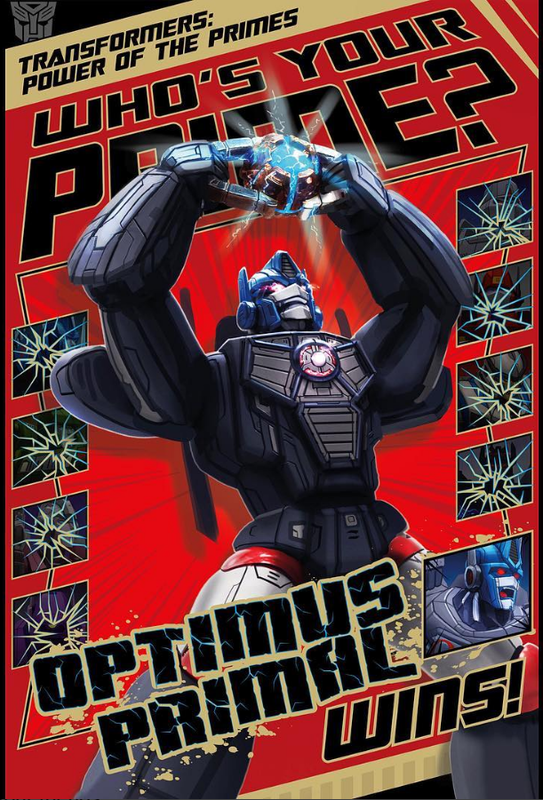 I wouldn't be surprised if he gets revived via ancient Cybertronian Primus magic MacGuffin, but he comes back as Orion Pax because that was his original form. And then he digivolves to Optimus Prime or however they handle that gimmick. Or maybe they won't even address it. They did Combiner Wars. No actual combining. All the combiners are just giant robots. They did Titans Return. Only one Titanmaster in the show and he never turns into a head. Ouch. Spoiler much? I tend to not be fully caught up on the latest Transformers shows only because it's better to stretch them out so I don't have nothing Transformers to watch. That and my DVR is so full I spend most of the time trying to keep it under 110% (it's always at 98% to 100% I stretched my DVR over the years it added on almost double the amount I originally could have. Why couldn't they get Gary Chalk back as Optimus Primal? He's busy battling with David Kaye on YouTube. Why couldn't they do that with the writers instead? Machinima is paying the writers. Ah, so they don't pay much probably. All times are GMT -4. The time now is 3:51 AM.